As plans progress on a nearly $1 billion expansion into the Lower Garden District, the Ernest N. Morial Convention Center is proposing a realignment of several streets to improve traffic flow through downtown, a new centralized hub for buses and taxis under the Pontchartrain Expressway, moving sidewalks to get conventioneers around the nearly mile-long facility, and possibly even an expansion of the riverfront streetcar to connect the upriver end of the project with the French Market, officials told neighbors Monday night. The convention center has already begun seeking a developer for the expansion, which would include a new four-star hotel, high-end shopping, and more exhibit space on land between the Pontchartrain Expressway and the old Market Street Power Plant, officials said Monday at the August monthly meeting of the Coliseum Square Association. The one-way section of Tchoupitoulas will extend from its current end point near Cochon all the way up to the area under the Pontchartrain Expressway, where it will make a loop with South Peters, which is already one-way all the way back down to Poydras. That change, officials said, will give large trucks from the port easier access to the highway on-ramps on South Peters without having to turn left across traffic on Tchoupitoulas, eliminating a major source of traffic jams for Uptown and downtown commuters alike. Magazine Street (between the Pontchartrain Expressway and Poydras) and Julia and St. Joseph streets (between Convention Center Boulevard and Magazine) would all then become two-way, to give drivers more options for navigating Tchoupitoulas and St. Peters. Convention Center Boulevard would drop from its current four lanes to one lane in each direction, making room for a new linear park. All buses and taxis would move off of Convention Center Boulevard to a new “intermodal” station under the expressway by Convention Center Boulevard. All passengers would load and unload from that location. Moving sidewalks would then help speed convention-goers from the convention halls in the Central Business District to the newer development in the Lower Garden District. Future renovations of the existing convention center might then envelop those moving sidewalks back indoors, officials said. Ultimately, the Convention Center is also in favor of the New Orleans RTA expanding the riverfront streetcar line all the way up the length of the project, giving visitors direct access back to the rest of the French Quarter. That decision, however, rests with the RTA, officials said. “We have told them we would grant them all the access they need from us,” Rodrigue said. The plan leaves room for another major future component not directly included in this expansion, officials said: Tulane University’s major parcel along the river, currently leased to Mardi Gras World. That property was once considered for a “Riversphere” facility that would include educational and research components, and Convention Center officials support Tulane’s plans in that direction. Whatever Tulane does, they said, would only be a further draw for convention-goers to return to New Orleans. Further, Rodrigue said, it would give New Orleanians more access to the riverfront as well. The Convention Center expansion is still years in the making. The Convention Center has issued a request for proposals — which will begin to provide more detail on what exact amenities will be included in the expansion project — and has begun hearing back from some of the top developers in the world, Rodrigue said. The expansion will include about $170 million of the Convention Center’s money — drawing from its reserves and from bond issues — and an anticipated $700 million from the private developer, so Rodrigue said he expects spending 18 months weighing different proposals to ensure the right project is chosen. Officials estimate that construction would begin some time in 2016. The hospitality industry — currently employing around 80,000 people in the area — could grow by as much as 12,000 to 15,000 jobs between now and 2018, Rodrigue said. South Peters, NOT St. Peter’s. One tweak I’d make is to realign the block of Convention Center Blvd. with the block in between the Casino and World Trade Building. That would eliminate an awful needless intersection at the end of Poydras Street. 1. Making Magazine St. two-way in the CBD may assist in navigation for some, but if you’re trying to avoid the traffic going towards the freeway (i.e., you’re continuing straight through to Uptown), that extra lane really helps. Expect Magazine to be far more backed up than it is now at evening rush hour. 2. Cutting Convention Center Boulevard down to two lanes for a “linear park” is downright stupid. First of all, that’s a clear loser for locals, who sacrifice traffic lanes for something we won’t even use. Secondly, it will greatly inhibit traffic flow because 1) you’re putting in a damn park for pedestrians to enter and leave in the middle of the road; 2) Convention Center Boulevard is a major artery; and, 3) many private vehicles currently use the extra lane as a pick-up and drop-off lane (especially on the lake side), and now they’ll just be blocking everybody. 3. Forcing passengers to an “intermodal” station under the freeway will presumably force them to cross Convention Center Boulevard, further reducing traffic flow. It’s also less convenient for conventioneers than simply having a larger road and allowing drop-offs along the entire length of the facility. 4. RTA doesn’t have money for tourist expansions right now. They’re talking about raising fares, and there are far more pressing service improvements needed. If you want to pitch expanding the Riverfront Streetcar, how about adding a station that people in the LGD can use? As a resident of the warehouse district since 1989 I agree with all points. In addition, the proposed loop makes S Peters and Tchoup a major thoroughfare for commercial traffic. 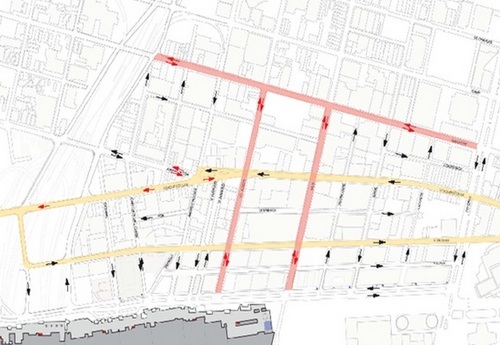 This results in increased noise pollution problems, air quality issues, reduced on street parking which is a currently a major issue for residents as well as vibration caused by truck traffic that is impacting historical buildings along this corridor already. Lets think through this before we make a major mistake. Owen, are they trying to landlock you again? 1. 2-way magazine could be connected to LGD, creating a seamless experience from the Audubon Park to Poydras. Good for business, good for sanity, good for safety, bad for PM rush hour commuters. 2. Good for pedestrians is good for everyone. Stop crying about streets really being “arteries” that should exclude people walking around for the benefit of drivers. This is a downtown area with lots of people, people who happen to be the “artery” of the darned CBD economy, not just a ramp to the Pontchartrain Expressway. I do agree that drop-off lanes should be used. 3. There exists a crosswalk under the Pontchartrain Expressway now to the parking area, and the signal is always green for traffic, never red. This strikes me as inhumane and dangerous. Good for traffic though, as long as nobody ever gets hit. 4. Agreed. Any streetcar expansion should cross the expressway into LGD. —-I am for more ways to get away from the convention center than more ways to get to it. Currently it seems most one way streets go toward Convention Center Blvd instead of away from it. Segregating pick up and drop off traffic (esp busses) from people passing through would be most effective – not reducing lanes. —-The major flaw I see with what is proposed is the section of Tchoupitoulas directly under the Ponchartrain Expressway between the two directions of Calliope – Currently trucks stack in the left lane of Tchoupitoulas to take a left on Calliope (using a green left arrow signal) and get on the Ponchartrain Expressway – this gives them an adequate turning radius to make the turn. Occasionally a truck takes the proposed route, but takes up both lanes making all the turns in order to make the turn without clipping the curb, light poles, traffic light posts etc. —-The proposal that says this problem will be alleviated by making Tchoupitoulas one way upriver and forcing ALL TRAFFIC INCLUDING LINES OF LARGE 18 WHEELERS to take a right on Calliope, then a left on S Peters, then a left on Calliope going through four signal lights to make what used to be just a single left turn at one signal light are CRAZY – when the trucks make these turns they straddle the 2 lanes blocking both in order to make the turn – this will create an absolute traffic nightmare. —-There will be four sequences of lights for the trucks to go through to ultimately make a left on Calliope instead of the current one – trucks in a long line are very slow moving when starting from red lights. So an increase from one to four red lights with turns will cause this route to be a parking lot. —-I would love to know who did the traffic study as they are clearly not qualified and did not thoroughly observe the existing conditions. So these moving sidewalks would be outdoors and exposed to the elements. Is there even that kind of tech that will work for years on end with the elements that we have here? Do they turn them off when conventions are not in session? And then what — they sit and corrode? Sounds absurd.